The Casio WSD-F10 Outdoor Smartwatch truly represents the second coming of Android Wear. It ends the era of identikit faux dress watches with no real USP. It reminds us that Android Wear has so much more to offer than pings from our smartphone and badly timed Google Now pronouncements. The Casio Outdoor Smartwatch is designed for those who love the great outdoors. It's a segment of people who would traditionally look to Suunto or Garmin – or perhaps Casio's non-smart but super-durable G-SHOCK brand – who the company now believes are better served by Android Wear. With dedicated modes for hiking, fishing and biking, a bevvy of sensors, the ability to hook into apps and services and access a world of data – is the Casio the ultimate outdoors watch? Or does the impending Nixon The Mission leave it stranded on the north face? We found out. So there's no denying it. The Casio WSD-F10 is an incredibly large piece of smartwatch. Up there with the Garmin Fenix 3, the Casio's bulk is a result of the meticulous waterproofing and dust-protection. It offers 50m water resistance designed to military standards – that's MIL-STD-810G, for the dust-proofing aficionados out there. It was the toughest smartwatch around, until the Nixon's The Mission trumped it at Baselworld 2016. With 100m of water resistance, the Nixon wins on the numbers, but both are pretty substantial. While it's without doubt one of the bulkiest watches going, it's not as heavy as you might think. It weighs 92g with the bulky rubber strap, but we didn't notice it overly, even on our slender wrists. It's certainly not for everyone, and perhaps too much to wear to the office every day despite the Android Wear features. But in outdoor watch terms, it even trumps the massive Fenix 3 (85g) and Suunto Traverse GPS (80g). Now onto the screen. The display is the biggest battery drain of any smartwatch, which is a serious problem when you're out on the hills. To counter this, the Casio employs two screens, which can be switched between to conserve power. The main screen is a colour 1.32-inch LCD display with a resolution of 320×300 pixels. It's not exactly mind-blowing, and it's one of the dullest displays we've seen on a smartwatch, presumably to save power. It's also devilishly reflective, which isn't fantastic in direct sunlight, and that's a bit of an issue for an outdoor watch. Head to the apps screen and choose Timepiece and you can toggle the screen into a monochrome mode. This low-power state will preserve battery, but locks out all extra functionality including the touchscreen. The sensors and apps are also off limits, so all you can do is check the time. If you're out on the hills it's probably the state you want to keep your watch in, before firing up the main OS to dip in and out of the WSD-F10's features. So what exactly can this Android Wear-toting hunk of smartwatch do? Well, by using Google's smartwatch OS it brings smartphone notifications and apps to your wrist, notifying you of any messages or calls – and offers you the ability to reply via voice or quick reply. There's also Google Now information, which comes in the form of tips from Google's services to help you out. This includes offering relevant bus times or travel information from your commute, diary reminders and so on, by harvesting information from the likes of Gmail, Google Calendar and Maps. This is the standard MO of Android Wear, and if you're particularly interested in those features check out our Android Wear review and guide to Android Wear, as these aspects are constant across Google-powered devices. But the Casio WSD-F10 changes things slightly. It adds its own apps and services hardcoded into the watch and its own app for controlling the experience. The main companion app is called Casio Moment Setter+ and this becomes your main point of contact once you've set up using the traditional Android Wear app. The Moment Setter+ enables you to customise the buttons on the right-hand side of the watch. In the Activity app there are options to track fishing, trekking and cycling as dedicated sports, plus of course you can use any Android Wear app, be it for running, cycling or any sport. And as you come to realise, that's the real power of the Casio as an outdoors watch. However, there's something that overshadows the entire ensemble: the lack of GPS. Yes, believe it or not, Casio opted not to add GPS to its outdoors smartwatch. That means that while you can enjoy live air pressure and weather data, it's missing the most obvious location data. All is not lost: you can piggy-back GPS from your smartphone, but that's problematic, too. If you're out on the hills the last thing you want is something draining your phone battery in case it's needed in an emergency. The lack of GPS is clearly an attempt to save precious battery power. However, it's not a trade-off that has to be made. The Fenix 3 has a low power GPS option for walking, which offers 50 hours of tracking. It can be done. The fact that Casio hasn't included built-in GPS points to a lack of technical prowess (few brands can hold a candle to Garmin's power management) or that Android Wear is too power hungry. Either way, it's a serious omission – and one that's being rectified by Nixon, even though the results are yet to be seen. So there's no GPS. Life must go on. And the Casio is filled with alternative sensors to bolster its outdoor prowess. Positioned around the bezel are sensors to read air pressure, altitude, an accelerometer, gyrometer and a magnetometer to act as a compass. It's an impressive list, but meaningless without harvesting the data. And Casio does that impressively though its Tool apps, and a handful of third party offerings. Firstly, the Activity app. This provides tracking for the tri-sportage of fishing, cycling and trekking that make up the Casio's USPs. Turn on fishing mode and you'll get elapsed time, atmospheric pressure change over the last two hours and the current atmospheric reading, so you can track weather changes in real time. 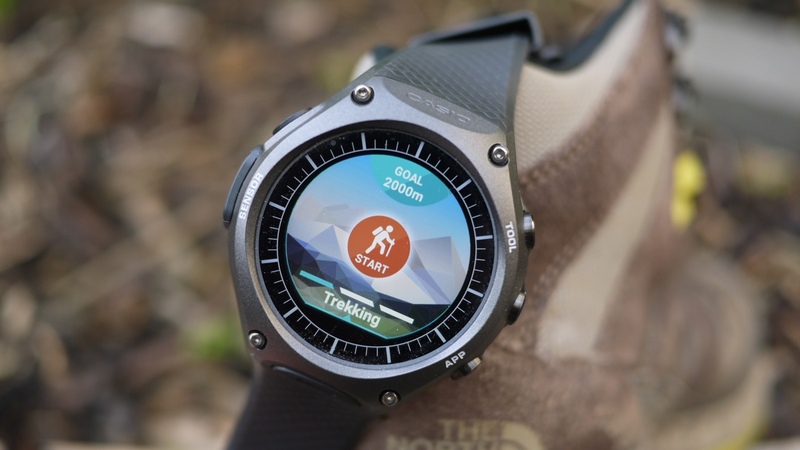 Trekking mode shows time, traveling speed and altitude remaining to your goal. And finally, cycling shows time and distance on the watch face. The three modes are slightly limiting, and it's a little annoying that you can't choose the information you see. For example, it would be great if fishing mode could swipe right for tide times, but it doesn't. You can, however, add some nifty alerts in the Casio Moment Setter+ app. In each mode you can set IFTTT style alerts: an alarm X hours before high tide in X city, show a map of your location every 30 minutes, a reminder to eat every time 500kcal is burned. There are scores of options to customise, and while there are shortcomings, it's great that Casio has made the sensors useful. Each sensor can be viewed on its own via the Tool button (or app) on the Casio. When the Tool app fires up, you can swipe through each sensor in turn to get full screen readouts. What's more, not every option is turned on by default, but a quick trip to the Casio Moment Setter+ app can apply extra data like sunrise/sunset data and My Graph, which is Casio's own activity tracking app that shows steps, calories and workout times. You can switch out of any tracking mode to cycle through these screens as you wish, just by heading back to the home screen and pressing the Tool button. All in all, the array of sensors and supporting apps is a real boon for Casio. They've made them impressively relevant and useful for those out on the hills, especially via the customisable alerts. It's just a shame that GPS can't complete the ensemble. While Casio's built-in apps are decent, the watch does provide you with some third-party options as well. This is just a handful of apps, though, and it's worth checking if your favourites can access the Casio's sensors. The main third-party app worth highlighting is Viewranger. This requires a free sign up and you can track walks and hikes in better detail than with the built-in Casio app. While the app on the Casio will track open hikes and display distance, altitude and heading, you can also set up routes on the smartphone app and have the watch guide you, which is especially useful if you're trekking off the beaten path. There are also apps from MyRadar and YAMAP pre-installed on the watch (you'll be fired off to Google Play to download the phone part). The crucial aspect of this whole ensemble is battery life. Can you spend all day on the hills and still have the Casio tracking your every move? Well, it's a tight run thing. Casio has done everything in its power to eke the maximum battery life out of the Outdoor Smartwatch, and it's just about succeeded in making it usable. As a basic smartwatch without using any of the power saving features, the Casio will last around a day and a half, which isn't that impressive given the size. However, in the various tracking modes the watch shuts itself down, switching to the low power screen. This means you're looking at roughly 20 hours of tracking, although it's highly dependent on the type of activity and how often you interact with the watch. The 20 hour figure came from the fishing mode, but the increased data points from cycling will take that figure down substantially. You will see even less stamina if using the live tracking in Viewranger, which shows your heading to GPS co-ordinates plotted within the app – again, this uses a handy low-power screen mode when not in use. This would take battery life down even further (again, dependent on how often you fire up the screen) and impact your phone's battery life too, tracking GPS. This, for many, will be a dealbreaker. To sum up, the Casio's clever battery saving techniques save its blushes, but test it hard enough and you will find the limits. Use the built-in apps and they should see you right for a good day outdoors, but if you're going away for the weekend, pack the charger. Now comes the second big problem. Not the $500 price tag, because in many ways that's worth it – the Garmin Fenix 3 will set you back the best part of $700. It's the availability of the Casio that is the big issue. The company hasn't updated us since it confirmed that the Casio WSD-F10 won't be released outside the US or Japan. While we have heard reports that Germany is next on the list, that's not confirmed by our Casio sources. What's more, while you can get it shipped overseas, a lot of the features are blocked. We had to sideload the Casio Moment Setter+ app which was awkward, and you still can't load tide times, for example, for non US or Japanese coastlines. With the Casio WSD-F10, Android Wear has come of age. The seamless transition between stock Google and Casio developed apps and sensors shows the power of the operating system. As an outdoors smartwatch Casio has a lot going for it – there's loads of data to enjoy and the company has gone a long way towards making it useful with the customisable alerts and alarms. However, the lack of GPS is a major bugbear and for many this will be a dealbreaker for the Casio. While there are sufficient workarounds, the chance to make the perfect outdoor smartwatch has been handed to Nixon, for now.